It is natural to associate the site of pain as the source of pain. If the pain is over the sacroiliac joint, it is a sacroiliac problem. If there is lateral thigh pain, it is probably a tensor fascia lata (TFL) syndrome. While pain often originates at the site of pain, other times pain is referred from another site: it is where it isn’t. This is the case with thoracolumbar junction syndrome. This malady can refer pain to the inguinal area, lateral thigh, and posterior pelvis (sacroiliac or gluteal region). I cannot recall the number of the patients treated for TFL syndrome with foam rolling and myofascial release therapy of the lateral thigh who were finally restored to normal after an adjustment to the thoracolumbar junction. Or, additionally, how many patients had been told for years they had a sacroiliac problem and had their SI adjusted ad nauseam, but received only limited relief. However, when the thoracolumbar junction was adjusted, their pain issues resolved. The intent of this series is to bring attention to other possible sources of pain than the most obvious. There have been many others who have written on this topic, but it deserves being resurrected every few years to keep us mindful. What I write here, and much of what has been written regarding these conditions, is based on our knowledge of anatomy and clinical observations. The astute doctor will view this and other writings on the subject through the lens of skeptical scrutiny while allowing for these clinical observations to one day be substantiated. I should note that conditions such as cluneal nerve entrapment, piriformis syndrome, and Maigne’s syndrome are primarily based on clinical observations with little firm evidence to substantiate their existence. Figure 1. The thoracolumbar junction syndrome is clearly defined by a triad pattern of pain involving the posterior pelvis, lateral thigh, and inguinal region. This image identifies the distribution of pain; the posterior pelvis (1), the inguinal region (2), and the lateral thigh (3). Musculoskeletal providers frequently see patients with inguinal pain, sacroiliac and buttocks pain, and lateral hip pain, and it is common to focus on the region of pain rather than other possible sources of it. Pain over the sacroiliac may be interpreted as originating in the sacroiliac joint, pain in the lateral thigh as Iliotibial band syndrome, and inguinal pain as psoas dysfunction. Doctors and therapists focusing on the region of pain, manipulate the painful sacroiliac, provide foam rollers for the “Iliotibial band” pain, and perform myofascial release on the psoas muscles. The nerves which innervate the skin over the sacroiliac and buttocks (the posterior ramus of the thoracolumbar segments/cluneal nerves), the inguinal region (the posterior ramus of the thoracolumbar segments), and the lateral thigh (the posterior ramus of the thoracolumbar segments/lateral cutaneous femoral nerve) originate from the thoracolumbar junction. It should be noted that the pain distribution may not follow standard dermatomal or peripheral nerve maps and that a sclerotomal pattern of pain (which will be a deeper pain) may be observed. Dermatome maps are general guidelines, but the actual dermatomes will vary from person to person. Figure 2. In addition to adjusting the thoracolumbar spine, the doctor may also prescribe a foam roller for home use. Clasp your hands behind your head with the foam roll underneath the upper portion of the thoracic spine. Extend backward over the roll while keeping the neck in a neutral posture. Repeat three or four times. Next roll the foam down the spine a few inches, and then repeat. Slowly work the foam roller down to the thoracolumbar junction. Maigne encouraged the use of spinal manipulation to treat this syndrome. Adjusting the lower thoracic and upper lumbar vertebrae (T10-L2) is the primary treatment. I prefer standing anterior to posterior adjustments. In addition to spinal adjustments, the patient can also self-treat at home with the use of a foam roller (figure 2). While the thoracolumbar spinal segments may be a source of pain in the inguinal region, buttocks, and lateral thigh regions as described by Maigne, there are other sources of symptoms. In subsequent articles I will address sources of nerve entrapment of the cluneal nerves, and lateral cutaneous femoral nerve, as well as conservative treatment options. Maigne R. - Sémiologie des dérangements intervertèbraux mineurs. Ann. Med. Phys. 1972. 15, 277-289. Maigne R. - Dérangements intervertèbraux mineurs et syndrome cellulo-téno-myalgique. Conceptions nouvelles des mécaniques des douleurs vertébrales communes. Rev. Méditer. Sci. Méd., 1978 5, 337-348. Maigne R. - Origine dorso-lombaire de certaines lombalgies basses. Rôle des articulations interapophysaires et des branches postérieures des nerfs rachidiens. Rev. Rhum. 1974, 41, 12, 781-789. Maigne R. - Le syndrome de la charnière dorso-lombaire. Lombalgies basses, douleurs pseudo-viscérales, pseudo-douleurs de hanche, pseudo-tendinite des adducteurs. Sem. Hôp. Paris 1981, 57, 11-12, 545-554. Maigne R. - Low back pain of thoracolumbar origin. Arch. Phys. Med. Rehabil. 1980, 61, 389-395. Maigne J.Y., Lazareth J.P., Guérin-Surville H., Maigne R. - The lateral cutaneous branches of the dorsal rami of the thoraco lumbar junction. An anatomical study on 37 dissections. Surg. Radiol. Anat. 1986, 8, 251-256. Maigne R., Le Corre F., Judet H. - Premiers résultats d’un traitement chirurgical de la lombalgie basse rebelle d’origine dorso-lombaire. Rev. Rhum. 1979, 46, 177-18. Motor control is an interactive process that allows the body to initiate activity to react to perturbations and other outside forces in a coordinated manner. Normal global reactive motor control is complicated when you consider the vast amount of interactive and competing neuronal transmissions that are involved. However, in the simple example of evoking a patellar reflex, we can see that a stimulus, in this case a reflex hammer, places a rapid stretch on the muscle spindle fibers of the quadriceps. This sudden rapid stretch results in an afferent nerve transmission to the spinal cord and brain. There is a resulting efferent message that, traveling through an intermediate interneuron, inhibits contractions of the hamstring muscle, while another efferent transmission evokes a rapid contraction of the quadriceps. This simple reflex arch is replicated in more complex patterns throughout the body. Figure 1. 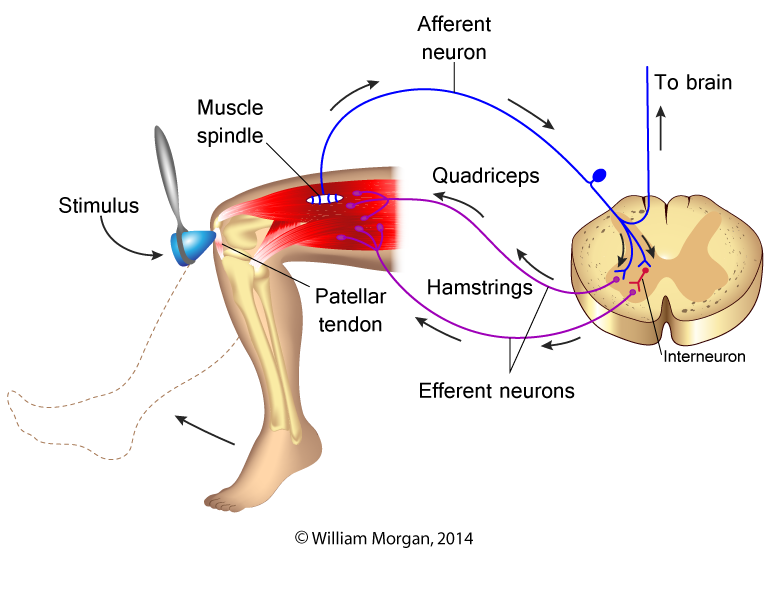 The myotatic (stretch) reflex of the patellar tendon. Applying this reflexive motor control model to the deep muscles of the core, it appears that there is a reflexive response between the small muscles of the spine (Intertransversarii, rotatores, and interspinales),1,2 ,3 and the spinal ligaments(3, 4) with the multifidus muscles. This reflexive control provides for a sensitive and reactive protective contractile response by the multifidus muscles. Certainly there has been a proliferation of research on the effects of the multifidus muscles and other core stabilizers (like the transverse abdominis) on spinal health since the publication of several landmark studies by a group of physiotherapists (Richardson, Hodges, Jull, and Hides) from Australia in the late 1990s/early 2000s. These innovators have changed the way we look at reactive spinal stabilization. Yet in spite of this wave of interest, we are forced to proceed with incomplete and imperfect knowledge in this developing field of discovery. What is evident is that the multifidus is a key component in the deep stabilization of the spine and is particularly susceptible to inhibition and atrophy following back injury. It is also evident from the research that the multifidus does not naturally recover from this post-injury inhibition and subsequent atrophy. Researchers are striving to find the right combinations of exercises to reverse this downward spiral. Figure 2. The normal protective response of the multifidus muscles: When potentially deleterious motions occur, the muscle spindle fibers in the small muscles of the spine are stimulated and send afferent impulses to the cord. Reflexive efferent impulses from the cord then cause the multifidus muscles to contract. This creates stability and protection for that motion. Chiropractic manipulation can enhance core stabilization, and particular exercises will also improve core stabilization. However, the synergistic effect of combining manipulation and exercise is preferred to either intervention alone. Core stabilization is a complex multifactorial system of sensory–motor control. It involves passive, active, and reactive components. As our understanding of the science of these mechanisms evolves, we will need to continually adapt our treatment programs and referral patterns to maximize our patients’ outcomes. Figure 3. Improved activation of the lumbar multifidus muscles has been observed following spinal manipulation. 1 Bodduk MD,PhD. Clinical Anatomy of the Lumbar Spine and Sacrum. NY Churchill Livingstone 1997. 104-5. 4 Solomonow M. Sensory-motor control of ligaments and associated neuromuscular disorders. J Electromyogr Kinesiol, 2006;16:549-67. 5 Le B, Davidson B, Solomonow D, et al. Neuromuscular control of lumbar instability following static work of various loads. Muscle Nerve, 2009;39:71-82. 6 Hides JL, Richardson CA, Jull GA. Multifidus recovery is not automatic after resolution of acute, first-episode low back pain. Spine, 2006; 21(23): 2763-9. 7 Standaert CM, Herring SM. Expert opinion and controversies in musculoskeletal and sports medicine: core stabilization as a treatment for low back pain. Arch Phys Med Rehabil, 2007;88:1734-6. 8Vera-Garcia FJ, Elvira JL, Brown SH, McGill SM. Effects of abdominal stabilization maneuvers on the control of spine motion and stability against sudden trunk perturbations. J Electromyogr Kinesiol, 2007;17:556-67. 10 Gill NW, Teyan DS, Lee IE. Improved contraction of the transversus abdominis immediately following spinal manipulation: a case study using real-time ultrasound imaging. Manual Therapy, 2007; 12: 280-5. 11 Brenner A, et al. Improved activation of lumbar multifidus following spinal manipulation: a case report applying rehabilitative ultrasound imaging. JOSPT, 2007; 7:613-7. 12 Koppenhaver SL, et al. Association between changes in abdominal and lumbar muscle thickness and clinical improvement after spinal manipulation. JOSPT, 2011; 41 (6): 389-99. 13 Fritz JM, et al. Preliminary investigation of the mechanisms underlying the effects of manipulation; exploration of a multivariate model including spinal stiffness, multifidus recruitment, and clinical findings. Spine, 2011;36 (21): 1772-81. 14 Marshall PP, Murphy BD. The effect of sacroiliac joint manipulation on feed-forward activation times of the deep abdominal musculature. JMPT, 2006; 29: 196-202. 15 Pickar JG, Wheeler JD. Response of muscle proprioceptors to spinal manipulative-like loads in the anesthetized cat. JMPT, 2001;24 (1): 2-11. 16 Pickar JG, Kang YM. Paraspinal muscle spindle responses to the duration of a spinal manipulation under force control. JMPT, 2006; 29: 22-31. 17 Sung PS, Kang YM, Pickar JG. Effect of spinal manipulation duration of a spinal manipulation on low threshold mechanoreceptors in the lumbar paraspinal muscles: a preliminary report. Spine, 2005; 30 (1): 115-22. I am usually the one encouraging the cause of interdisciplinary collaboration. But there are times when I feel there are interventions that are inappropriately applied in medical pain practices. One that I am particularly skeptical about is a pain clinic procedure called a medial branch block or medial branch neurotomy. In this procedure the intent is to destroy the nerve (the medial branch of the posterior primary ramus) that innervates the facets in an attempt to treat back pain that originates in the facet. Why is the Medial Branch Important? All of these structures are part of a complex reactive mechanism that interacts to provide stabilization and protection to the spine. So when pain physicians treat facet pain with a neurotomy, they are also destroying the nerves to the spinal components that protect the facets from further damage. Prior to performing a neurotomy, the pain physician usually performs a trial injection with anesthesia like lidocaine. The needle is guided with fluoroscopy. If the anesthesia reduces or eliminates the pain, that indicates to the physician that they have isolated the nerves that convey the sensation of pain to the facets. The physician will then use a radiofrequency ablation probe to produce enough heat to destroy the nerve. In time, the nerve may regenerate and the procedure may need to be repeated. Denervation of the medial branch of the posterior primary ramus has demonstrated some potential for providing long term control of facet pain. While major harm caused by this procedure is very rare, the potential long term effect on the facets and other spinal anatomy (I guess this would be classified as minor harm) has not been adequately studied. Medical branch denervation procedures are being utilized on a grand scale without being substantiated by rigorous randomized controlled studies. In fact, one study that is highly referenced is a case series with only five patients! In this study, Dreyfus revealed that the multifidus did atrophy after radiofrequency neurotomy, but the authors concluded that this was inconsequential because of the pain relief that lasted for twelve months following the procedure. [iii] Multifidus atrophy of multiple levels following a single level medial branch radiofrequency ablation was identified through the use of electromyography in a case published by Wu. [iv] This shows diffuse atrophy of the multifidus muscles following radiofrequency ablation (RFA). A case series here and a case there may not seem like much to base so many conclusions on, but that is all we have. There is a deafening silence when it comes to researching the long term effects of this procedure on the zygapophoseal joints. Something else that concerns me is the long term effects this procedure will have on the facets. Medial branch ablation effectively creates a Charcot joint of the facets. Charcot joint is the term given to a joint that has a neuroarthopathy that renders it devoid of sensation. The name Charcot’s joint was given by the French neurologist Jean-Marie Charcot who noted a pattern of joint destruction in patients with the loss of joint sensation. In a Charcot joint the patient is unable to perceive the pain of joint damage so they will engage in joint damaging activities and not even know it. Currently there are no randomized control studies we can look to that address the long term effects of spinal facet joint anesthesia. Several years ago I was speaking at a foreign spine surgeon conference, the sole chiropractor speaking to hundreds of international spine surgeons. During a panel discussion I expressed my misgivings about neurotomy of the medial branch and its potential harm to the multifidus. One of the spine surgeons on the panel then proceeded to ridicule me in front of his colleagues and state that medial branch of the posterior primary rami is totally sensory; it does not have a motor component. I was dumbfounded. He is performing these procedures and did not even know that he was ablating a motor nerve. I cornered the surgeon later in the conference and showed him the evidence that this nerve was indeed both motor and sensory. I was vindicated when, much to his credit, he acknowledged his mistake and apologized to me from the podium of the conference in front of the attendees. From my experience and research I draw these conclusions: these procedures do reduce facet pain and can do it for a long time. These particular spinal procedures rarely cause life threatening harm. However, this procedure has risks for causing further harm to the facets and other structures of the spine and this procedure should only be performed after all other conservative care, including chiropractic, has failed. I also conclude that the long term effects of this procedure is understudied, and there is not nearly enough evidence for this procedure to be utilized at its current level. The underlying causes of knee pain and dysfunction are rarely isolated to the knee. The knee is a relatively stable joint with limited intrinsic ability to adapt to aberrant motion. Usually when there is a problem with the knee, it originates in the foot/ankle complex or in the hip region. The foot and the hip have the ability to adapt and accommodate to changes in gait, terrain, and directional forces much better than the knee. In our last article we shared how the gluteal muscles contribute to hip extension and the transference of motion and power to the leg through the knee in a sagittal (flexion/extension motion) plane. In this installment we will discuss how the gluteus maximus (GM) muscle also affects the transverse (internal and external rotational) planes of motion of the lower extremities. Though we are emphasizing the gluteal muscles and knee in this portion of this series, it is the authors’ intent to convey the overall interconnectedness of the body. The lower extremity is an aggregate of many structures that work together to produce locomotion. The gluteus maximus muscle originates medially from the posterior ilium along the gluteal line and the posterior third of the iliac crest, the sacrum, the sacrotuberous ligament and the coccyx (figure 1). One quarter of it inserts into the gluteal tuberosity of the femur, and the remaining three quarters into the iliotibial band (which inserts into the anterior portion of the lateral condyle of the tibia at Gerdy's tubercle). The action/function of the GM is to extend and externally rotate the hip. The GM also assists in maintaining the knee in extension due to its connection to the anterior portion of the tibia via the iliotibial band. Since the primary function of the GM is to externally rotate and extend the knee, a weak or inhibited GM can result in internal rotation of the femur, placing the knee into genu valgus (figure 2). This [genu valgus] position greatly increases the likelihood of an anterior cruciate ligament (ACL) injury. Elements that contribute to the degradation of athletic form resulting from fatigue are multiple. Not only does local muscle fatigue contribute to increased risk of injury, but also metabolic fatigue, aerobic fatigue, and fatigue of the central and peripheral nervous systems. [vi] Fatigue has been cited in contributing to or causing a lag in neuromuscular activation,[vii] reduced coordination,[viii] diminished balance,[ix] and impeded muscle force. [x] [xi] Studies have also shown increased electromyography (EMG) activity of the quadriceps and hamstrings as the GM fatigues. [xii] As a result, optimal performance patterns are substituted with sub-optimal motion patterns that are more likely to contribute to injury. Conditioning for strength and endurance is important to athletes, but so is managing rest and play time. Weekend-long tournaments in which athletes play one game after another will yield high rates of ACL injuries as fatigue takes its toll. Coaches must rotate players in and out of games to ensure that athletic fatigue does not contribute to injury. Women are much more prone to knee injuries than men. In fact depending on the research, women athletes are two to nine times more likely to have an ACL rupture than their male counterparts. [xiii] The real question is why, and what we do about it. There has been much written about this subject, and there are several theories, but no one reason has been able to fully explain this phenomenon. Some of the possible causes include the wider Q angle (between the pelvis and the femur) found in women due to the fact that they have a wider pelvis (figure 3). Other factors unique to women are increased laxity of ligaments, slower reflex time, weaker hamstrings (in relationship to the quadriceps), hormonal effects of estrogen on the strength of the ACL, smaller ACL and intercondylar notch, and poor landing technique when leaping. One factor that can be easily identified and managed is GM weakness. Identifying gluteal weakness requires developing a keen eye for internal knee rotation and the appearance of a valgus migration during functional motion. Manual muscle testing may be used to grade more overt weakness, but gait analysis and observation of the patient moving through more functional motor patterns are better methods for identifying more subtle gluteal weakness patterns. Observing a patient perform single-leg squats can reveal the subtle signs of a weak GM (figure 4). The weight bearing leg should remain stable and straight as the patient descends. If the knee migrates medially into a valgus position, this is an indication of GM weakness. A variation of this test is to observe the patient descending stairs, again observing for medial migration of the knee. A more rigorous evaluation intended for athletes may include squat jumping (repeated jumping and landing into a deep squat). If the knees approximate, it is indicative of weak GM. Some doctors will even analyze the patient while performing single-leg hops or box jumping. The use of video recording with performance analyses software can aid the doctor in analyzing these motion patterns. If the athlete lands or jumps with valgus migration of the knees, the athlete should be coached in motion patterns that avoid genu valgus and internal hip rotation. They should also be instructed in a specific program of GM strengthening. The advent of coaching, sports performance and analysis software, and mobile device applications has made it easy to record video of functional motions such as running, descending stairs, jumping, and squatting. Using the frame-by-frame play-back to look for medial migration of the knee allows a clear view into a patient’s motion patterns. Many of these video applications come with line drawing analysis tools. This technology allows for video to be taken on the sports field or other locations and sent to doctors for analysis. Determining the management of a patient with GM weakness is dependent upon how far along the patient is in their rehabilitation. An athlete with no overt injury wishing to increase athletic power will start at a higher level of training than a patient recovering from injury. Nonetheless, when considering an athlete, we need to prepare for the higher rate of knee injury that accompanies fatigue and weakness by conditioning the GM for endurance and strength. For athletes who are intent on improving performance versus rehabilitating from a state of infirmity, we like to include weighted squats with elastic band tubing around the distal thigh, just above the knee. This provides a gentle stimulus and tactile cue that helps them to activate their GM during this motion. Other exercises that may enhance GM activation include hip thrusters from a supine bridge, lunges, kettle bell swings and squats, and box jumping. A less intense method of exercise would use exercise tubing around the legs, just above the knees, and exercising in a partial squat with the GM activated by abduction and mild external rotation. Additionally “monster” walks, side walking, partial squats, and hip thrusts will stimulate and strengthen the GM. Patients unable to tolerate these exercises may begin with side-lying “clams” and progress through the track. In addition to conditioning the GM with the intent to increase strength and endurance, aberrant motion patterns should be corrected with technical motion training. This would involve training patients how to properly squat, how to activate the GM while descending stairs, and how to perform other activities of daily living. For athletes, this would include coaching in running, jumping, and agility components of their particular sport. A strong GM plays a protective role in the knee and will increase power in both athletes and the general population. [v] Ortiz A, Olson SL, et al. Fatigue Effects on Knee Joint Stability During Two Jump Tasks in Women. J Strength Cond Res. Apr 2010; 24(4): 1019–1027. [ix] Greig M, Wlker-Johnson C. The influence of soccer-specific fatigue on functional stability. Physical Therapy in Sport. 2007;8:185–190. Figure 1. Schematic of the gluteus maximus. The medial to lateral and obliquely superior to inferior orientation of the gluteus maximus results in this muscle extending and externally rotate the hip. Figure 2. Gluteus maximus weakness creates a cascade of events that increases the likelihood of injury. GM weakness causes a contralateral pelvic lowering, ipsilateral internal rotation of the femur which results in a valgus position of the knee and compensatory hyperpronation. Figure 3. The Q angle (quadriceps angle) is the angle formed by the intersection of two lines: the line from the middle of the patella to the anterior superior iliac spine (ASIS) and a line from the tibial tubercle through the middle of the tubercle. Figure 4. Testing for gluteus maximus weakness. Clinical testing of the GM can be done by having the patient perform a one leg squat or hop or by watching the patient descend stairs. The knee should track down straight in alignment with the tibia and femur (left image). If the knee migrates medially (right image), it indicates a motion pattern fault and likely a weak gluteus maximus. Complex joints like the knee should not be manipulated with high-velocity low-amplitude (thrusting) manipulations injudiciously. Just because we can manipulate, does not mean that we should manipulate. Clinically, I (Morgan) have found that when a patient tells me that it feels like his knee needs to pop and asks for an adjustment, that there is often joint effusion within the knee and it is likely to have an internal derangement like a medial meniscus tear. This is a time to avoid thrusting manipulations of a joint. Much of the time knee dysfunction arises from the hips and pelvis or the foot and ankle. We are much more likely to address the foot, ankle, hip, and lumbo-pelvis regions than the knee when treating knee impairments. Likewise we are likely to include active care that addresses the gluteal muscles and closed chained exercises rather than isolating the knee with open chain exercises like the leg extension. Frequently we look to activate and strengthen the gluteal muscles to reduce unhealthy motion patterns and stresses from the knee. Injections for back pain: the evidence is weak!!! "The effectiveness and safety of epidural administration of corticosteroids have not been established, and FDA has not approved corticosteroids for this use. " "FDA is warning that injection of corticosteroids into the epidural space of the spine may result in rare but serious adverse events, including loss of vision, stroke, paralysis, and death." This document clearly states that epidural steroid injections are not FDA approved and acknowledges the serious risks of using this procedure. It also states that the effectiveness of epidural steroid injections has not been established. Graduating with a professional degree does not automatically convey professionalism to the recipient of the degree. A graduate degree is only part of the journey to becoming a professional. In fact most people with graduate degrees never reach the level of being a professional. Becoming a “pro” is a life changing transformation which is costly, and most of us cannot bear the cost. A professional degree does not make a person a professional any more than a self-defense class makes the student a champion cage fighter. In both cases the training is the first step in a lifetime journey that requires self-sacrifice, focus, hard training, and relentlessness. In fact various occupations are filled with acolytes trying to find an easy way to turn pro. They take class after class, seminar after seminar, certification after certification hoping to find the easy way to becoming a professional. They latch onto a hero and cling to their every word. Ironically the ability to turn pro requires nothing external. It is an internal decision to become more: more committed to your life’s work, more consumed with learning, and more dedicated to create. When you decide to turn pro you begin to do the hard things in life, to live life without excuse or alibi. You understand your life’s mission and your decisions and schedule will change to reflect this. After you have decided to turn pro you will no longer view the world the same. You no longer will use technology as an opiate; compulsively texting, tweeting, checking Facebook, or playing games. You will use technology to leverage your work and influence. You relentlessly pursue you work whether you feel like it or not. You will have clarity in your life’s mission. One definition of a professional is someone who does their work well, even when they do not feel like it. Does becoming a pro mean that life is all work and no play? No, turning pro makes the rewards of life all the sweeter. Think of how good a cold beverage tastes after working hard in the hot sun, or how good your bed feels after an exhausting day of work. Hard work makes the rewards of life sweeter. Contrary to what modern culture and the media tries to tell you, life is about work, not about play. Becoming a pro means that what you do is no longer a job it becomes your calling. You become a harrier, relentlessly pursuing your prey. You do not go the office and act like a professional and then leave the office and become a different person. You are always the professional. You will become relentless in your pursuits. As a doctor you will engage in daily practice-based learning. You will relentlessly seek to expand your skills and knowledge. When you turn pro, your life changes. You become focused on your life’s work. You are no longer Dr. Bob or Dr. Brittany performing spinal screenings at the mall. You stop using oversimplified models of patient care. You no longer cling on every word of your guru or hero. You are an impassioned and you relentlessly pursue your work. Your passion and determination will attract patients to you. It will also intimidate your peers. No one will turn pro without making a conscious decision to change and to become relentless in the pursuit of professionalism. The transition may be painful, but the fulfillment is worth the price. Pressfield, Steven. Turning Pro: Tap Your Inner Power and Create Your Life’s Work. New York: Black Irish Entertainment LLC, 2012. Roosevelt, Theodore. “Citizenship in a Republic.” The Sorbonne. Paris, France. 23 April 1910. If done right a career in chiropractic will become increasingly rewarding with the passaging of each year. The key to avoiding burnout is to continually challenge yourself to greater levels of knowledge and competencies. As I mentor young chiropractors, I try to impart some of the knowledge that I have gained and some of the missteps that I have taken. As I reflect on a three decade career, I would like to share six things that I wish that I had known when I started practice. The need to master the examination. In college we all learned how to give an incredibly detailed examination that analyzed many aspects of a patient’s health. The only problem with it was that it took two to three hours to complete. What we learned in chiropractic college was so detailed that it was impractical. So impractical that most chiropractors never mastered the exam and stick to a very focused examination. A few years ago I purposed to master the neuro/ortho/chiropractic examination. I practiced and arranged the examination until I could perform a 148 point examination and document it in ten minutes. How to read MRI. Of course when I graduated MRIs were not available, but as the years progressed I realized what a valuable tool these studies are. When patients would bring their MRIs to my office I would muddle through reading them until I finally committed myself to learn to read MRI. For years I went to morning report with our neurosurgery and neuroradiology departments until I learned how to read MR. There will be negative outcomes. A great physician once told me after I strained a patient’s ribs with a side posture adjustment, “Bill if you don’t want any negative outcomes, don’t treat any patients.” No healer ever wants to injure a patient, but it is unavoidable for every profession. Much of being a good doctor is helping patients understand risk and striving to minimize patient risk. Treating patients is what we do, and we must do it with confidence to attain the desired results. The need to confront patient behavior. When I first started practice I was so concerned that patients would like me that I would not confront them on important issues. Issues like smoking, obesity, diet, exercise, sleep deprivation, and other harmful lifestyle choices. I now have no hesitations about confronting a patient’s behavior. That is not to say that I am unsympathetic to my patients, I confront them with love. One of my student interns had difficulty confronting an obese patient over her weight. I told the student to treat the number on the scale the same way that she would treat the numbers on a blood pressure cuff. They are both health indicator metrics that need to be addressed. How rewarding being a chiropractor would be. I thought that being a chiropractor would be a great profession when I selected it as my chosen profession many years ago, but from this vantage I can honestly say it was far, far more rewarding than I ever thought it would be. Saving lives and saving lifestyles is what we do every day. I have heard from several physician patients, “You have the best job in this hospital.” Every time I hear that phrase I am warmed by the knowledge of its truth. Being the top of your class at graduation does not ensure that you will be a top clinician 30 years later. Becoming a master clinician is not a sprint, it is a marathon. Your knowledge at graduation is a starting point, not an end point. If you pursue lifelong learning and advancement you will continually improve and develop as a clinician and after many years, achieve clinical mastery. I should note that I had no idea how hard it would be to stay abreast of the expanding body of knowledge in healthcare. It takes a concerted effort to have a career of continual growth and development, but the alternative is mediocrity. A professional does her work well, even when she does not feel like it. Master clinicians are masters of their craft whether they feel inspired or not. Inspiration is for amateurs.